for astral groupings on cosmic screen. that lends a haunting parameter. plus in background more galactic spots. into the nimbus are wandering. with the enchantment of dreamy ways. plus often joined with the spinning wheel. for destiny high on fortune’s throne. but can only partially negate. no matter the steps for deterrence. a deathly sleep shall overtake her. when a king’s son comes to awake her. no expedient means could suffice. bade her to open each portal shut. in search of something she knew not what. requested to try her hand at it. as in the classic story was writ. to her side in tears that tragic morn. as all around grew thicket and thorn. for the mournful mortals to bring relief. Then mercifully they slept as well. with the lovers enveloped in bliss. what dreams held the princess in their sway? till she woke up, enlightened at last? with its vast celestial dominion. Will humans awaken while they’re here? 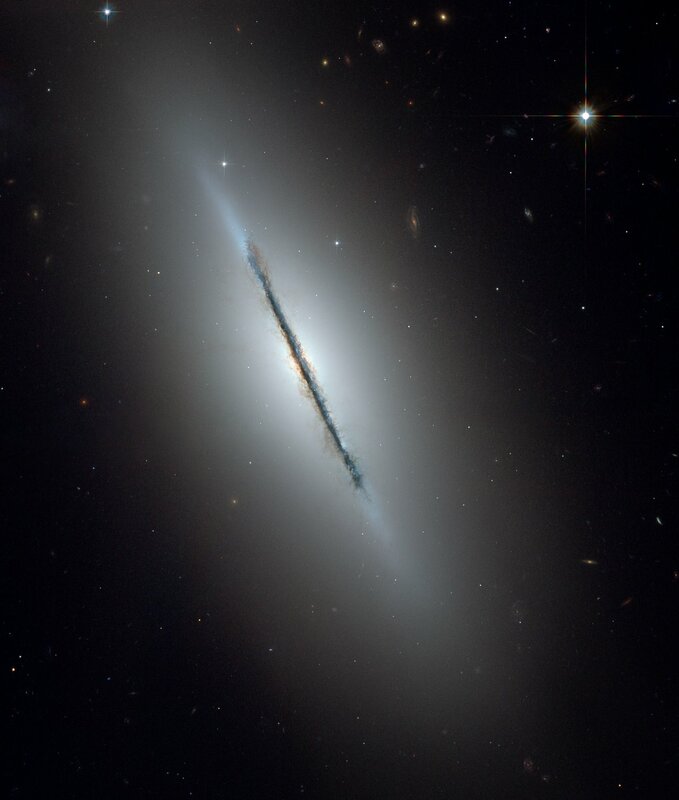 Image explanation ~ This is a unique NASA/ESA Hubble Space Telescope view of the disk galaxy NGC 5866 tilted nearly edge-on to our line-of-sight. Hubble’s sharp vision reveals a crisp dust lane dividing the galaxy into two halves. The image highlights the galaxy’s structure: a subtle, reddish bulge surrounding a bright nucleus, a blue disk of stars running parallel to the dust lane, and a transparent outer halo. Some faint, wispy trails of dust can be seen meandering away from the disk of the galaxy out into the bulge and inner halo of the galaxy. The outer halo is dotted with numerous gravitationally bound clusters of nearly a million stars each, known as globular clusters. Background galaxies that are millions to billions of light-years farther away than NGC 5866 are also seen through the halo. NGC 5866 is a disk galaxy of type “S0” (pronounced s-zero). Viewed face on, it would look like a smooth, flat disk with little spiral structure. It remains in the spiral category because of the flatness of the main disk of stars as opposed to the more spherically rotund (or ellipsoidal) class of galaxies called “ellipticals”. Such S0 galaxies, with disks like spirals and large bulges like ellipticals, are called ‘lenticular’ galaxies. NGC 5866 lies in the Northern constellation Draco, at a distance of 44 million light-years. It has a diameter of roughly 60,000 light-years only two-thirds the diameter of the Milky Way, although its mass is similar to our galaxy. This Hubble image of NGC 5866 is a combination of blue, green and red observations taken with the Advanced Camera for Surveys in February 2006.